In Sedgwick County, an unlikely hero emerges in the battle for capitalism over cronyism. Now that the result of the 2014 general election is official, Richard Ranzau has notched four consecutive election victories over candidates endorsed by the Wichita Eagle and often by the Wichita Metro Chamber of Commerce. It’s interesting and useful to look back at what the Wichita Eagle wrote during each campaign as it endorsed Ranzau’s opponent. In a district reaching from downtown Wichita north to include Maize, Valley Center and Park City, Republican voters would do well to replace retiring Commissioner Kelly Parks with the commissioner he unseated in 2006, Lucy Burtnett. Her business experience and vast community involvement, as well as her understanding of the issues and thoughtful voting record during her two years on the commission, make her the pick in this primary. She would like to see a new life for the Kansas Coliseum site, perhaps including a year-round RV park, and favors the county’s continued role in Fair Fares and the National Center for Aviation Training. The other candidate is Richard Ranzau , a physician assistant retired from the Army Reserves who believes government is out of control, who would submit all tax increases to voters, and who opposes the county’s investments in air service and aviation training. The Wichita Metro Chamber of Commerce political action committee contributed to Burtnett. In this election, Ranzau received 55 percent of the vote. State Sen. Oletha Faust-Goudeau, D-Wichita, is by far the better choice in the race to replace Republican Kelly Parks, who is stepping down after one term representing the county’s north-central district. Her legislative experience, civic engagement and constituent service have prepared her for a seat on the county commission, where she wants to help attract businesses and jobs and would support efforts such as the new National Center for Aviation Training. “That’s a must,” she said. It’s a concern that Faust-Goudeau has been slow to address code violations at a house she owns, but the fact that neighbors have stepped up to help says a lot about her as a person and public servant. The first African-American woman elected to the Kansas Senate, Faust-Goudeau would make a hardworking and effective county commissioner. Republican Richard Ranzau, a physician assistant retired from the Army Reserves, holds inflexible anti-tax, free-market views that would be disastrous for the county’s crucial efforts to support economic development and invest in affordable air service and aviation training. In this election, Ranzau again earned 55 percent of the vote. Carolyn McGinn is the clear choice to represent this district that includes part of north Wichita as well as Maize, Park City and Valley Center. McGinn served on the commission from 1998 through 2004. Since then, she has served in the Kansas Senate, including as past chairwoman of the Senate Ways and Means Committee. As a result, McGinn knows state and local issues well and understands how they intersect. She is concerned about the region’s stagnant economic growth. In order to get businesses to come and grow here, the county needs a stable government structure that provides essential services, she argues. McGinn is a productive problem solver who could have an immediate positive impact on the commission. The Wichita Metro Chamber of Commerce also endorsed McGinn. In this election, Ranzau received 54 percent of the vote. The Wichita Metro Chamber of Commerce also endorsed McCray-Miller. This election was closer, with Ranzau gathering 51 percent of the vote to McCray-Miller’s 49 percent. As a private entity, the Wichita Eagle is free to print whatever it wants. So too is the Wichita Metro Chamber of Commerce free to contribute to and endorse anyone. But these two institutions appear to be out of touch with voters. Do you sense a pattern? 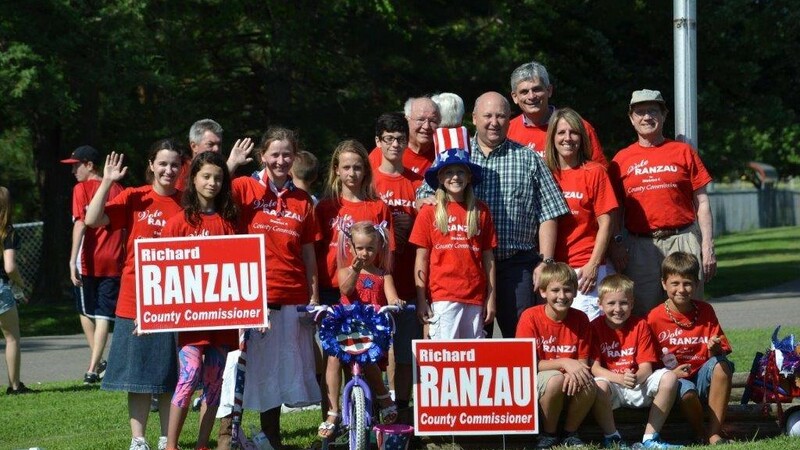 Ranzau’s opponents are thoughtful, would make hardworking and effective county commissioners, are productive problem solvers, understand government at both the state and local levels, and have a balanced, collaborative approach to dealing with issues and people. Ranzau, according to the Eagle, believes government is out of control and holds inflexible anti-tax, free-market views. He frequently badgers county staff. (Believe me, they deserve scrutiny, which the Eagle calls “badgering.”) Oh, and he’s ideological, too. That simply means he has “a system of ideas and ideals, especially one that forms the basis of economic or political theory and policy.” As long as those ideals are oriented in favor of capitalism, economic freedom, and personal liberty, this is good. And that’s the way it is with Richard Ranzau. Would that the Wichita Eagle shared the same ideology. I know what it is like to be on the losing side of issues year after year. Advocating for free markets and capitalism against the likes of the Wichita Eagle, the Wichita Metro Chamber of Commerce, most members of the Sedgwick County Commission, and all current members of the Wichita city council is a lonely job. This makes it all the more remarkable that Richard Ranzau has won four consecutive elections running against not only his opponent, but also against the city’s entrenched establishment. Running against the crony establishment, that is, the establishment that campaigns against capitalism in favor of a “business-friendly” environment. The establishment that has presided over decades of sub-standard economic performance. The establishment that insisted on a sales tax that it hoped would gloss over the miserable results produced over the last two decades. Thank goodness that defenders of capitalism are able to win an election now and then — or four in a row. The term “understands how it works” for the last 20 years has been the bribery provided by the now official paper and a construction industry group that wants control over the official for campaign contributions. Kelly Parks stated thats why he didnt run again, because of the blind sided federal agencies that indict in other areas, Atlanta, Louisville, and others, that were doing the same thing. But Wichita doesn’t have to take a back seat to any of those criminal element cities, looks like People have much work ahead to help Ranzau be effective. He nor Parks could be “bought” by any group. Keep up the great work of getting the other side out Bob. Great article, Bob. I lover every word of it. On a night when the Republicans took control of the Senate with Pat Roberts among their among their number, Brownback’s victory staving off a tax-and-spend challenge, and Kris Kobach’s sensible reforms being vindicated, Ranzau’s victory was probably the most satisfying result of election night. This editorial says more about the eagle and the decline in the newspaper business in Wichita than anything else. The eagle’s endorsement in a GOP primary is a, “kiss of death.” It is not a lot better in a general election. The owners of the eagle, the far left McClatchy (Sacramento & Fresno Bee) newspaper chain, does not seem to realize the consequences of their editorial actions. It looks ultra-slow learners on the editorial side.